What is Data and Information? Write the differences between Data and Information. Raw materials used in a process to obtain targeted result of goal are called data. In other words, pieces of information which by itself may or may not mean something but useful when connected or used with other pieces of information to form a piece of information that means something, are called data. Numbers, both integer and floating point, are numeric data. Such as, 1, 2, 3, 5.5 etc. 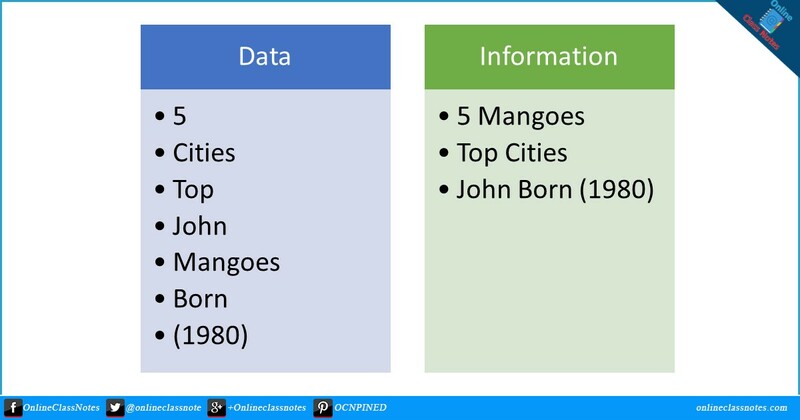 These numbers mean nothing unless they are used with other data, for example, 5 mangoes. Anything which is not a number is a non-numeric data, such as, a string, a photo, audio, video etc. Also, characters, symbols etc. are example of non-numeric data. Information is collection of data or processed data. The output of a process is information. Not all information has to be important but information is supposed to be easy, meaningful, correct, complete, dependable, to the point, safe and updated. Pieces of information used in a process to obtain resulted information. Processed data which is meaningful, complete and useful. Data is a unit of information. Information is a collection of data in a useful and meaningful way. Data can be or can’t be useful. Information is supposed to be useful. Data do not rely on information. Data is never treated as information. Information from a process can be treated as data of another process.